Radoslav from drServer has contacted us recently with a hot deal compared to their normal pricing. This plan is powered by KVM with RAID-10 SSD’s so expect it to be pretty speedy with the dedicated resources. They mentioned this place comes with double the RAM and a much lower price then the standard plan. They are a registered company in the state of Delaware, USA (File Number: 6850501). You can find their TOS here. They accept PayPal and BitPay as payment methods. will the recurring be same price? Hello, yes the recurring will be the same price. Does this KVM VPS support docker? Sooooo, a VPS is not allowed to run ANY server software, basically? This applies only to shared hosting. This has 8GB RAM and your Thanksgiving sale had 2GB RAM. Both have almost the same price $100 USD vs $84 USD…. am I missing something. Is there something else that is better on the thanksgiving VPS? The thanksgiving sale was older. This has more RAM and is baseed on our standard plan with 4 GB RAM for $15/mo. Also the Thanksgiving plan was HDD, this is SSD. got pulled up as fraud, all resolved within the hour though – nice one. Thank you. 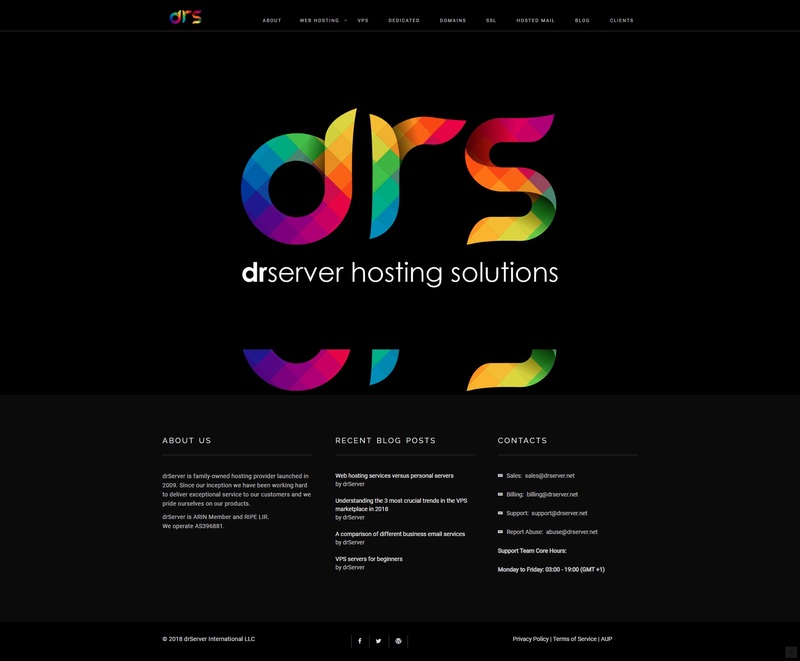 Welcome to drServer family. is there’s limit on cpu usage ? , is ram dedicated or shared ? The CPU policy is fair-use. RAM is dedicated to each VPS. Any user may not: b) Run stand-alone, unattended server-side processes at any point in time on the server. This includes ANY AND ALL daemons, such as IRCD. Really, this just looks like a clause to suspend VPS for whatever reason as there is several dozens stand-alone, unattended server-side processes running at every point. Hello, this only applies to shared hosting. Really interested in this, worried about CPU suspensions though. Looking to run remote Linux desktop and just leave it idling when I’m not working. Hello, as long as you are not doing any unreasonable things, you should be fine. Here are results. Maybe just Cyber Monday Rush? Are there any offers include extra features? How about custom OS (ISO) installation?